It may be pointed out that most of the ancient Christian families in Kerala claim that their forefathers were Brahmins who received baptism from St.Thomas, the Apostle. That is, Mar Thoma along with the Jewish merchant Haban landed at Kodungalloor in AD.52 and baptized Brahmins belonging to families like Kali, Kalikavu, Sankoorickal etc.But scholars like Dr.Babu Paul I.A.S, Dr.A.Sreedara Menon and Dr.M.G.S.Narayanan disagree with this concept. As there is no historical evidence for the above concept, Manamelites do not claim Brahmin lineage for two millenia.However, Manamelites too have a Brahmin lineage. It is believed that two brothers of the Thekkedathu Mana at Kudamaloor protested against some of the evil practices prevalent among the then Brahmin community. They were ousted from the community and were forced to leave the place in a country boat along the Meenachil river. They travelled from vadakkumkoor and sought asylum in Thekkumkoor .On the way, they landed at Kalloorkadu Church, now known as “Champakkulam Palli” built in AD.427.On the advice of the parish Vicar, they met Kuruppampady Kallarackal Mathu Tharakan,one of the ministers of Aditya Varma,the then King of Thekkumkoor,the headquarters of which were at Ambalapuzha.As per instructions from the minister, the two brothers received baptism from the parish Vicar. The parish offered them two small plots of land on either side of the Pampa river at Changankary, near Edathua.The younger of the two brothers was very brilliant and hardworking. He built a small house on the northern side of one plot and the two brothers settled there. He named his house ‘Mana Mel’ (ie.Manakkum Mele), intended to mean that they were superior to the members of the Thekkedathu Mana, their ancestors. In course of time, it came to be called Manamel.By hard work they flourished there and acquired more land. The parish priest of Kalloorkadu Church first helped the younger brother to find a bride from a noble Christian family.Then, on the advice of the priest, he built a new house for his elder brother on the southern bank of the river. The elder brother shifted to the new house and named it Thekkedathu.He also soon got married, the two families, Manamel and Thekkedathu are direct descendants of the ancestral Thekkedathu Mana. From the baptism records of St.George Forane Church, Edathua and the partition documents available at the village offices, we could trace one Mr.Kuruvila who had two sons, Idicula and Mathulla.This is shown in the family tree chart published in 1985.The elder son Idicula married a girl from “Pullukattu” family changanacherry.Her father Pullukattu ‘Asan’ was an influential man, Once when he was returning from Ambalapuzha after visiting Aditya Varma,the King of Thekkumkoor,Kuttanad got flooded. He landed at Changankary, Edathua to visit his daughter and son-in-law. To save them from the frequent floods he brought them to Changanacherry and helped them to build a house at Vadakkekala near St.Mary’s Cathedral, Changanacherry and they settled there. Thus the life of Manamelites at Changanacherry began.Even the house of Mr.M.V.George Manamel (M.175) (the oldest living member) is more than 150 years old. It is apparent that the ancestors of Manamelites came to Changanacherry more than 300 years ago. 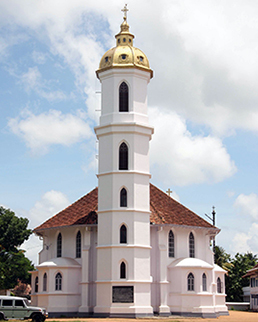 As per records available at Changanacherry St.Mary’s Cathedral Church, on 1-2-1891 the Church bought the Vadakkekala land from Manamelites at a cost of Rs.600 and handed it over to the Carmelite Convent.Dr.Charles Lavinge,the first Bishop of Kottayam Vicariate constructed a three storied building and stayed there with his staff. Using this money,Manamelites bought separate plots at Market road,Pookkattuchira,Nedumchira(west of Bishop’s Palace),Kavala(north of Central Studio),Morkulangara,Kurisummoodu and Valiakulam and settled there. It is the descendants of those who settled in these plots who claim to be Manamelites belonging to the Syrian Catholic Community at places like Cheeranchira, Madukkamoodu, Thrikodithanam, Koothrapally, Nedumkunnam, Kanam, Manalady, Chennamkary, Thiruvanamthapuram, Puthenkurissu, Thrissur, Kannoor etc.Many of the descendants of those who continued at Edathua itself later migrated to places like Mepral,Chanjody,Thalayolaparambu,Kozhikode etc. and some of them belong to the Orthodox Jacobite Community in the Malabar region and they have not yet been included in the family tree given in the form of charts as we have not yet succeeded in proving the parental lineage with them. We deeply regret this failure. To foster the relationship among the family members, which started in decreasing tendency by the origin of nuclear families, some sort of family association was felt necessary by the great visionary Rev.Fr.Manamel John Damatian C.M.I (M.134) some 50 years ago. Even though he tried his best to unite Manamelites in a Kudumbayogam he could not achieve it during his life time (1916-1982).But by the grace of God his successors accomplished it in the year 1985.They met at the residence of late Mr.M.D.Joseph (M.132) at Valiyakulam on 15.08.1985 and elected the first committee comprising of Prof.M.M.Thomas (M.83) President, Mr.Thomas Chacko (M.46) Secretary and Mr.Mathai Kuriakose (M.6) Treasurer. The first meeting held in the residence of late Sri.M.M.Mathew (M.81, c.231) near S.B.College was inaugurated on 03.11.1985 by first Patron late Sri.M.V.Abraham (M.166, c.82) by lighting Nilavilakku, the symbol of Manamel Kudumbayogam.Now our Kudumbayogam has two supporting wings named Vanitha Vedi and Manamel Youth Movement.The charitable society named Manamel Caritas (Reg no.K.246/06) was registered in 2006.Since then it has been working for the betterment of the different sections of our society without any discrimination. The Family tree chart and the other sections are meant to provide more information about each member of the Family.